It was almost a year ago when we first heard about the concept of ‘Cellular PCs’ running Windows 10 on ARM processors. At Computex Taipei this summer Qualcomm further highlighted the promise of what it called ‘Snapdragon PCs’ which could enable the kind of ‘hypermobile experience’, we enjoy with our always-connected sleek and fanless smartphones and tablets. At Computex we learned that the mobile PCs powered by Qualcomm Snapdragon 835 processors would be sleek, thin and fanless and offer “beyond all-day battery life” with unparalleled LTE connectivity. Qualcomm went on to demo such a PC which ran Windows 10 and popular applications using x86 emulation in what looked to be a snappy and responsive way. Qualcomm held a summit in Hong Kong earlier this week and behind the scenes more information was forthcoming about the capabilities of Snapdragon PCs. The Verge reports that multi-day battery life “beyond our expectations” was observed by Microsoft when testing the new mobile PC systems. Pete Bernard, a program manager at Microsoft, said that the ARM-powered machines are game-changers, so much so that initial product testers thought that the Windows 10 battery gauge was broken as it takes so long for the battery to deplete. 'Multi-day' battery life is now confidently touted by people with hands-on time with these Snapdragon PCs. The above reports are a little vague on timescales but Fudzilla garnered further insight from Cristiano Amon, EVP at Qualcomm Technologies. Apparently the exec confirmed that an extreme battery life gain is observed using Qualcomm’s ARM chips in Windows 10 laptops. For example, you could watch Netflix videos for up to 29 hours straight on one of these thin and light devices before you would have to connect the power cord. If you are running with both LTE and Wi-Fi enabled, the battery life will dip into the low 20+ hours range though. Windows 10 PCs based upon the Snapdragon 835 SoC are expected to be showcased by the likes of HP, Lenovo and Asus by the time CES 2018 comes around, if not earlier. *Shocking News* Low power SoC means longer battery life… as expected? Those test engineers must have been unaware what they were testing. Tablets/netbooks using ARM SOCs or the previous Atom solutions have always had generally better battery life than laptops using a much more performant Core i3/5/7… that is the whole point isn't it - that they have long battery life and just about acceptable performance for lightweight tasks? These ARM Windows laptops are just a refinement of the old netbook idea. 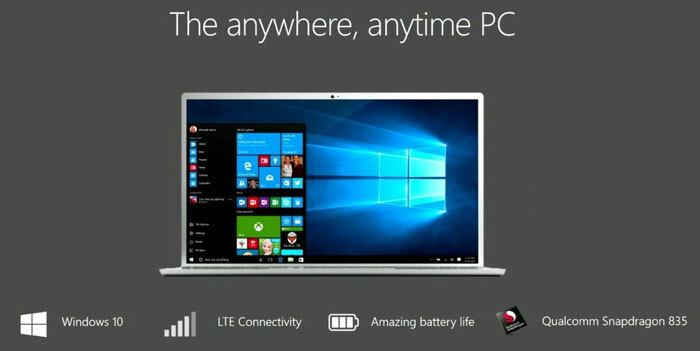 The only ‘innovation’ here is Windows running on ARM with x86_64 emulation. I thought the backlight was the main power sink when watching videos. Are these figures with the backlight turned right down? A nice information, to finaly have full windows 10 on ARM PC for semi light workloads. That may put some more presure to Intel and AMD, which is a good thing. Despite kingpotnoodles pessimism i think this is pretty great. Its the combination which is a boon; we've had notebooks before but never with this much battery life and the cellular capabilities of having a snapdragon soc whilst able to run windows. Still I wonder how smoothly the emulation will work and how limited performance will be. ISTR the emulation is only 386, presumably because the 386 is out of patent protection, so I wonder how useful this will really be. More to the point, does it run U-boot or Coreboot so can I put Linux on it?